Join Publisher Keith Martin on an eight day discovery of Classic Cars, UK Auctions and the amazing Goodwood Revival. Keith, As SCM publisher, Classic Car Judge and TV personality has years of experience and the ability to bring together a wonderful visit to the UK. Meet the ‘right’ car preparers, visit the top sales showrooms and join in the camaraderie with true Car Collectors. 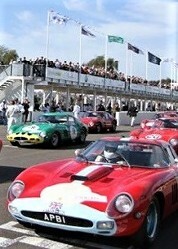 Special guests and places fill this program culminating with the Goodwood Revival. Your own private Suite, Paddock access and, highlight racing guests are all part of this fantastic experience. Monday, September 9 – At Noon you are welcomed at London’s Heathrow Airport and whisked to our luxury London hotel. This afternoon is kept free to settle into your surroundings. At 6 pm, we visit the nearby ‘London Eye’ for a forty-five minute ‘flight’ with all of London at your feet. Following, we stroll down the South Bank of the River Thames to the Swan restaurant, at the historic Shakespeare Old Globe for our welcome dinner. 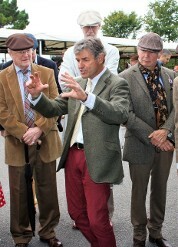 Keith will explain the London car collecting scene we are visiting over the next few days. Next three nights at the Westminster Bridge Plaza Hotel. Tuesday, September 10 – This morning we visit the South Kensington area, home to many of the classic car showrooms and working garages. You are introduced to a number of the major classic car companies and their principals. 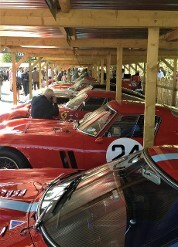 Many of them will be preparing for the upcoming Goodwood Revival and auction. Our lunch stop is at the ancient and famous Grenadier pub, a favorite meeting spot for car collectors. This afternoon, we travel a short distance to Hendon, a RAF base during WWII. Here is housed the Battle of Britain Museum and the RAF Museum. The exhibit of aircraft stretches from the emergence of flight up to the present day. A whole building is dedicated to Battle of Britain aircraft. This evening is extremely special with a private dinner at the Royal Automobile Club on Pall Mall. We are joined by a guest speaker from Bonhams. Wednesday, September 11 – This morning we board a private coach for a journey to the small village of Grove. Nestled in the Cotswold landscape is the headquarters of Williams F1. We have a private tour through the Williams F1 museum, one of the most remarkable and complete F1 exhibits. We also visit their awards room followed by a private lunch in their VIP suites. Upon our return to London we visit Churchill’s War Rooms. This underground bunker is where Winston Churchill ran his war machine. The bunker was opened to the public, unchanged, exactly how it was, now eighty years ago. Tonight, an evening in the West End. London theatre is is brilliant and we opt for one of the top musicals. However, as the theatre scene is constantly changing, we announce the show closer to the tour date. Thursday, September 12 – Today, we depart London for the south coast. Enroute we have a very full day. Once aboard our private coach, we head for nearby Brooklands, the first dedicated race track. Its huge banking is still evident. Now a museum, it displays many of the cars and motor bikes that ran the circuit. It also houses a fine display of commercial aircraft, including the Concorde. Not to be missed is the large shed exhibiting the history of London ‘double-decker’ buses. Following a pub lunch stop, we continue on to the Beaulieu National Motor Museum in the heart of the New Forest. This is undoubtedly the finest motor museum in Britain. Later this afternoon, we check into the Marriott Hotel in Portsmouth, our home for the next four nights. This evening dinner is at our hotel and includes a guest speaker. Friday, September 13 – Our next three days we are at the Goodwood Revival. Friday is very much a ‘warm up’ day. It’s less crowded and a great day to explore the event. There is so much to see, you will only be able to scratch the surface today. We have scheduled a ‘paddock walkabout’ with Keith and Alain De Cadenet, where you have an opportunity to view up close the incredible machinery that will be racing this week end. This afternoon, we slate a visit to Bonhams Auction for a preview. Keith will be joined by SCM Senior Auction Analyst Paul Hardiman, and SCM legal contributor, barrister and car collector Martin Emmison along with Bonhams personnel for an indepth look at what will be crossing the block on Saturday. This evening, we have a relaxing dinner in a local Coaching Inn. Saturday, September 14 – Full day at the Goodwood Revival in the ultimate Salvadori Private Suites. The best viewing location. Our private suite looks out to the chicane with a grass embankment that runs down to the track. You can opt to view the cars from the pavilion or from deckchairs on the grass. Breakfast, champagne, gourmet lunch and afternoon High Tea is included in the Hospitality Suite. Wine and beer beverages served all day. This afternoon is the Bonhams Auction where you can attend as Keith’s guests. This evening at leisure in Portsmouth . 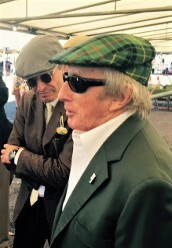 Sunday, September 15 – Another full day at Goodwood Revival and the Salvadori Private Suite. 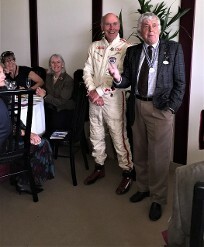 We anticipate visits to our Suite by Richard Attwood and Brian Redman, between their stints on the track. Again, breakfast, lunch, High Tea, champagne, wine and beer beverages are served during the day. To conclude this fabulous weekend of Classic Racecars, we have an evening dinner at our hotel with special guest Derek Bell, five time Le Mans winner. Monday, September 16 - Following breakfast, we return you back to London’s Heathrow airport.